Note: I did this for Hurricane Ike with the benefit of time behind me. Hurricane Harvey is a fresher wound. As I currently live 3.5-hours northwest of Houston my wife, daughter, dogs, and I were not directly affected. It rained for a couple of days. But my dad, mom, grandparents, step-mom, aunt, cousin, nephew, and countless friends (real-life and Twitter both) live basically on a line from Sugar Land to La Porte. At no point do I want to minimize the tragedy of Harvey by talking about the Astros. I get through a lot of crap in my life by thinking about the Astros. This is another way of processing for me. All times listed below are in Central Time. Honestly, with the talent we have in here, and the way we've played, anything less than getting to the World Series would be a disappointment...I really believe this can be the year...I think we need one more guy, a No. 1 or No. 2 type of guy in the rotation and another reliever. We get that, it would be a dream come true. And I think Jeff (Luhnow) is going to get it done for us. I really do. This is the year. Later that day, Dallas Keuchel is placed on the 10-Day DL with neck discomfort, retroactive to June 5. There is "no timetable" for his return. 9:54pm: The Astros score five runs in the 9th inning to beat the Royals 6-1. Lance McCullers throws 7IP, 2H/1ER, 8K:2BB. The Astros are 43-18 and have a 13-game lead in the division. Buster Olney reports that the Tigers want a big prospect return - without offering any salary relief - in any trade for Justin Verlander. Jon Morosi reports for MLB.com that, if Verlander is traded, Houston or Los Angeles seem to be the likeliest destinations. He later adds on Twitter that the Tigers are now willing to include "some" cash to offset the $68m Verlander is owed over the next three seasons. Bob Nightengale says the Astros need to trade for a frontline starting pitcher and predicts a Joe Musgrove, Forrest Whitley, Teoscar Hernandez package to Oakland for Sonny Gray. That night Carlos Correa tears a ligament in his left thumb in the 4th inning of a 9-7 loss to Seattle. The Astros are 62-31 and have a 15.5-game lead in the AL West. He is estimated to be out 6-8 weeks. Verlander is the 2011 AL Cy Young Award winner who's had tons of postseason appearances, but Sonny Gray is younger, cheaper and has more upside at this point. The Astros are interested in Verlander, according to Anthony Fenech, but talks have been "minimal." Jon Morosi reports that talks between Houston and Oakland are "heating up" over Sonny Gray. Jon Heyman: "Not seeing Houston as a real alternative for JV." Dallas Keuchel and Will Harris are activated from the DL, while Springer goes on the DL with a strained quad suffered after catching a spike on the Philly grass. Verlander throws 6IP, 5H/0ER, 6K:3BB in a 13-1 Tigers win over...the Astros, who are 68-36 and have a 16-game lead in the division. The trade deadline comes and goes and the Astros add only reliever Francisco Liriano. The Astros beat the Rays, 14-7. With Keuchel and McHugh back in the rotation, Lance McCullers goes on the DL with "back discomfort." After starting the season 12-3 with a 2.69 ERA, McCullers went 0-4 with a 9.64 ERA in July. I'm not going to lie. Disappointment is a little bit of an understatement. Chris Archer beats Mike Fiers as the Rays take the first game of a three-game series. The Tigers put Justin Verlander on revocable waivers. Dallas Keuchel gets the start against Tampa Bay and allows 7H/3ER, 2K:2BB in 5IP. Houston native Austin Pruitt throws 6.1 shutout innings in a 3-0 Tampa Bay win. Prized July 31 deadline acquisition Francisco Liriano makes his Astros debut and takes the loss after he faces three Rays, allows a walk and a hit (both baserunners will come around to score in a three-run 7th inning). The Astros are 69-39 with a 15-game lead on Seattle. The Astros score four runs in the bottom of the 9th to beat the Blue Jays, 7-6. Alex Bregman triples with two outs to tie the game and one batter later Former Astros Great Juan Centeno walked it off with a single. Jeff Luhnow tells KHOU that a waiver wire deal is "possible but not probable." 11:05pm: Jon Morosi reports that the Astros and Tigers talked about a possible Verlander trade but it's "unclear if there is momentum in talks." The Astros are off, and are 2-4 since the trade deadline before embarking on an eight-game road trip to Chicago, Arlington, and Arizona on Tuesday. Bob Nightengale: The Tigers are expecting Verlander to stay in Detroit at least until winter. Verlander can't go more than seven innings anymore, but he also can't be underestimated. His last decade of work makes him the no-brainer choice for a big game. My case for this comes down to one number: 136. That's the best OPS+ in baseball, which is held by the Houston Astros, and it means that adjusted for ballpark, the Astros' offense has been roughly 36 percent better than the league average. That's also the best ERA+ in baseball, held by the Los Angeles Dodgers, meaning their pitching has been roughly 36 percent better than the league average. In the series opener at Chicago, every White Sox player records at least one hit in an 8-5 win over the Astros. Despite working Derek Holland for seven hits and five walks in 5.1IP, the Astros can only manage three runs, going 1x8 w/RISP and leaving ten on base. Dallas Keuchel threw 4IP, allowing 10H/8ER, with 2K:3BB. In his three starts since returning from the DL, Keuchel has thrown 12IP, 23H/14ER, 7K:8BB for a 10.50 ERA, 2.50 WHIP, and a 1.107 OPS-against. There are issues, most definitely. But every team goes through a slide at some point. The Astros just need to figure out how to stop it, because Justin Verlander (probably) isn't walking through that door. And even if he was, is his presence magical enough to fix Dallas Keuchel? Or maybe he can talk Francisco Liriano into embracing the idea of leaving an inherited runner on base? I was searching for mechanics from day one and knew it wasn't right and tinkered with a bunch of different things and finally thought I found it...and told you guys when I thought I found it. In the last five or six starts since then, it's been a drastic improvement. The Astros, according to sources, did show some interest in a Verlander deal, but were unwilling to surrender any of the prospects the Tigers wanted or to take on a significant amount of his remaining contract...Is he worth $28 million a season, or anything close to that? Is he worth the type of prospects the Tigers continue to seek in a deal? If he's the difference in winning a World Series, then yes he most definitely is. It's nothing against our guys but any time you can make your team better you should have the opportunity to do that and take full advantage. I think deep down, we were all down in the dumps because we had a pretty good shot to help this team get over the hump to where we need to be. That time has passed and we can't dwell on that, we have all the confidence in everybody we have now, we just have to get out of this slump right now. Later that night the Astros carry a 2-1 lead into the bottom of the 9th in the series finale with Chicago. Ken Giles serves up a game-tying solo home run before Francis Martes allows two hits in the 11th for a 3-2 walk-off White Sox win. The Astros have lost seven of their last nine games. It's amazing how many people start freaking out when you don't have a couple good starts. The world's ending or you're not as good anymore. You're a scrub. Stay the course, and that's good. That's what you've got to do if you want to last in this game. A broad area of low pressure southwest of the Cape Verde is detected by the National Weather Service. It was given a low chance of a tropical cyclogenesis over the next five days. Late that night the Astros trade cash to the White Sox for Tyler Clippard. Ken Rosenthal says they'd like to add another lefty reliever in August. 7:00am: The low pressure area (Invest 91L) is given a 20% and 60% chance of developing over the next two days and five days, respectively. ...The atmospheric setup expected over the Atlantic later this week and much of next week is one that has been a historically favorable incubator for tropical systems. Weather models are in agreement on this and multiple models show a lot of noise coming out of the tropical Atlantic over the next two weeks. Zack Greinke outduels Collin McHugh in a 2-0 Arizona win. Altuve strikes out three times in the same game for the first time since 2014. The Astros are 1-6 on the road trip, 3-10 in August. Their division lead is 11.5 games and their lead on the Red Sox for the best record in the AL sits at five games. Brian McCann goes on the 10-Day DL with a sore right knee. Those tracking the Tigers (report) that the team would like to get a deal done this month, rather than wait until the offseason, and is working with that goal in mind. I'd be lying if I said it wasn't on my mind. Jon Heyman tweets that the Astros and Tigers talked about Verlander last week, but are still far apart. Invest 91L heads south to the Caribbean Sea, where conditions are not thought to be conducive for intensification. Having scored nine runs in the previous four games combined, the Astros score eight runs before Arizona gets on the board and ride it out to a 9-4 win. While no deal is close, circumstances are such that one phone call could create momentum rapidly, closer to Aug. 31 roster deadline. ...generally the forecast models steer (Invest 91L) toward the Yucatan Peninsula, and keep it confined to the southern Gulf of Mexico - away from Texas. That's probably what will happen, but at this far out there are no guarantees, so we're going to continue to watch it. FanGraphs re-ranks the Astros' Top 10 prospects and slots pitcher Franklin Perez at #3 (where he was in their pre-season rankings), behind Kyle Tucker and Forrest Whitley. Daz Cameron ranks #8. The Astros beat Arizona 9-5 to enjoy their first W2 since July 24-25. Josh Reddick hit a home run off a lefty for the first time since 2015. Jon Heyman writes that, though talks between Houston and Detroit were "reignited" last week, a trade appears to have been "put to bed." 10:00am: "Potential Tropical Cyclone Nine" is advised by the NWS, 295 miles east of Barbados where tropical cyclone warnings and watches are issued for the Lesser Antilles. Some weather models seemed to think that Harvey would downgrade into a tropical wave. 4:00pm: A well-defined circulation and sustained tropical storm-force winds leads the National Weather Service to name Tropical Storm Harvey. Tropical Storm Harvey seems likely to form as soon as it approaches the Lesser Antilles. Typically we'd be very concerned about such a system, but for now it appears most likely to remain on a due westward course across the Caribbean Sea, meaning that probably will not move into the central Gulf of Mexico. The Astros delayed making an announcement as to Lance McCullers' next steps in his rehab from back discomfort. Things got weird. Hinch mentioned using the DL as a mental break. McCullers said he'd talk about it in a "couple of days, when A.J. and them determine what's the next step." The lack of clarity by the Detroit Tigers on their direction, the slow-playing of interested teams and Verlander's choice not to pursue a deal through public or backchannel lobbying. Over the next five days, Harvey should continue to slowly work across the Caribbean. It's unlikely to strengthen much initially, but once in the Western Caribbean, it may have an opportunity to gather some intensity before it heads toward Honduras, Belize, or the Yucatan. Dallas Keuchel posts back-to-back solid starts in a 3-1 win over Oakland. Franklin Perez, the youngest pitcher in the Texas League (ahead of 2nd-youngest pitcher Forrest Whitley), throws 6IP, 2H/2ER, 4K:2BB in a win. Major league sources indicate the Astros aren't shutting the door completely on Verlander...Houston has always needed starting pitching reinforcement and Verlander is the best available. 4:00pm A reconnaissance plane shows a less-defined organization and indeed downgrades Harvey into a tropical depression. 10:00pm: Harvey is further downgraded to a tropical wave, with the caveat that Harvey could reintensify near the Yucatan Peninsula or the Bay of Campeche. Morning: The National Hurricane Center gives the remnants of Harvey a "medium chance" of development over the next five days. Over the next few hours the chance of development of Harvey is increased to High. Afternoon: Harvey regains Tropical Storm-force winds. I went out there against the best team in baseball, and this morning I just kind of told myself I was going to take a playoff type of intensity out there and not let these guys sweep us. It's impossible to really create a playoff atmosphere without being in the playoffs, but I tried my best to do that and use that much more focus and intensity on every pitch. The Astros lose to Oakland, 3-2. The Astros are 7-12 in August, the highest number of losses in any calendar month of the 2017 season. Harvey passes over Belize "barely noticed." Harvey reaches the Yucatan Peninsula. We're starting to become a bit concerned about undead Harvey for two reasons - it has the potential to produce a lot of rainfall, and the forecast tracks have been edging northward, from a final landfall among the central Mexican coast to now closer to south or central Texas. The latter scenario, especially, could produce a lot of rainfall for Texas, including Houston. 1:00pm: The National Hurricane Center for the first time mentions the possibility of hurricane-force winds hitting the Texas coast. ...the model is illustrative of the fact that this is a tropical system that could very well move inland into Texas somewhere along the coast, more or less stall, and drop 10 to 15 inches of rain (or more) on someone's head over a two or three day period. The Astros lose 4-3 to the Nationals and are 16-20 since the All-Star Break. A landfall between Corpus Christi and Matagorda seems most likely at this time. While we may see some storm surges of 3 to 5 feet with such a storm, and tropical storm-force winds, rainfall is by far the biggest concern. 10:00am: Harvey regenerates into a tropical depression in the Bay of Campeche, maximum sustained winds are at 35mph. 10:00pm: Harvey reaches maximum sustained winds of 40mph making it - once again - a tropical storm located 500 miles southeast of Port O'Connor. By Sunday, running through about Wednesday, the greater Houston region will be at risk for very heavy rainfall and potentially widespread flooding, and coastal regions may be most at risk...The forecast for next week remains highly speculative for Texas, but ranges from bad to very, very bad in terms of flooding potential. ...Will cause Harvey to slow down considerably during its approach toward the Texas coast and then potentially stall on days 3 through 5. Life-threatening flooding is expected across much of the Texas coast from heavy rainfall of 12 to 20 inches, with isolated amounts as high as 30 inches, from Friday through early next week. The European Model for Harvey predicts that Harvey will stop just inland after running into high pressure, get pushed back out into the Gulf, and move further up the coast toward Houston. That was the day when we realized that it was going to be much worse. We had aircraft data and saw the storm was beginning to rapidly intensify. 7:05pm: Carlos Correa begins his rehab assignment in Corpus. 8:24pm: Someone named Cbach posts on City-Data that, through a circuitous connection, Harris County Commissioner Steve Radack says Harvey could dump 50" of rain on Houston with 100,000 homes destroyed and 10,000 homes submerged. It's either going to be pretty bad, or really really bad here. Cleveland beats Boston 13-6 to improve to 70-56. Cleveland has a 5.5-game lead in the AL Central and are 6.5-games back of Houston for the AL's best record. 12:00am: Harvey's maximum sustained winds reach 100mph, 220 miles southeast of Corpus Christi. For Texas, there will be two epochs of Harvey: the catastrophic effects from wind and surge during the next day or so for the central Texas coast, and the unfolding widespread, major flood event from Saturday through the middle of next week for a large swath of the state, including Houston. Catastrophic and life-threatening flooding is expected across the middle and upper Texas coast from heavy rainfall of 15 to 25 inches, with isolated amounts as high as 35 inches, through Wednesday. 2:00pm: Harvey is classified as a Category 3 hurricane with winds as high as 57mph while it sits 75 miles east-southeast of Corpus, where storm surges are already reaching 1-2' there and in Port Aransas. I feel confident that a lot of people, perhaps most of the area between Corpus Christi and Beaumont, have a good chance of seeing a lot of rain. Like widespread 10 to 25 inches of rain over the next five or six days. Or maybe more. 6:00pm: Still 45 miles from Corpus, Harvey is now a Category 4 hurricane with maximum sustained winds of 130mph. Aransas Pass is reporting 96mph wind gusts. Making landfall at its current intensity would make Harvey the strongest hurricane to hit Texas since Carla in 1961. Tornado warnings are issued for Houston until at least 2am on Saturday. 9:10pm: Lance McCullers makes his first rehab start for Fresno and throws 3IP, 3H/3ER, 1K:5BB with a wild pitch and an intentional walk. Life-threatening storm surge flooding could reach heights of 9 to 13 feet above ground level at the coast between Port Aransas and Port O'Connor. 10:58pm: Harris County Judge Ed Emmett "bats down" a rumor from Sugar Land lawyer Ross Bale that Harvey will be far worse than current warnings indicate and warns Bale to "leave the emergency warnings to" Emmett and other officials. 12:50am: A tornado touches down in Sienna Plantation in Missouri City, damaging at least 50 homes. 4:00am: The NHC says rain accumulations of 15-30" are expected with "isolated maximum amounts of 40 inches over the middle and upper Texas coast" through the following Wednesday. The NHC continues to say that "rainfall of this magnitude will cause catastrophic and life-threatening flooding." 5:00am: The first Harvey-related death is reported in Rockport. 10:00am: After 12 hours of sitting inland, Harvey appeared to be "weakening," but could weaken slower than expected given what is currently sitting over the Gulf of Mexico. Afternoon: A tornado hit Cypress. 4:00pm: The NHC reports that "Harvey has barely moved during the past few hours and little motion is anticipated...Harvey could easily meander for the next four to five days over southeast Texas." 7:32pm: Lance McCullers' next rehab start will be for Corpus at Frisco. 9:15pm: Waller and Stafford are receiving 4" of rain per hour, "twice the carrying capacity of most bayous in the Houston area". Street flooding is reported near I-10 and the Sam Houston Tollway. 9:27pm: The National Weather Service issues a flash-flood warning for most of west/central Houston and elsewhere from Hockley to Fresno until 12:15am. 10:00pm: Winds are decreasing but the storm is not really moving. 11:08pm: Brad Peacock throws 6IP, 3H/1ER, 8K:1BB but after enjoying a 6-1 lead going into the 7th inning, a bullpen of Liriano, Martes, and Clippard each allow two runs to give the Angels a 7-6 win. Angels' leadoff man Cameron Maybin goes 0x3 with 3K. 12:45am: The Harris County Flood Control District says that the amount of rainfall is already at 500-year levels. The Houston-Galveston office of the National Weather Service issues three Flash Flood Emergencies for the Houston region, having perviously only issued one in the five years that the warning existed. Bullpen security chief Kurt Rogers, a 37-year veteran of the Houston Police Department, and his crew work to rescue dozens of stranded people in a dump truck with a snorkel exhaust that allows him to drive in four feet of water. 1:45am: The National Weather Service issues, for the first time ever, a "Flash Flood Emergency for Catastrophic Life Threatening Flooding" until 6:45am. 6:45am: The NWS advises people who need to be rescued to go to the roof of their house, not to the attic, where rising waters can trap them. The situation seems horrible now, and with the prospect of more rain, you may feel hopeless or helpless, or both. From a mental health standpoint, the uncertainty this brings adds a considerable amount of stress to an already stressful situation. I wish we could tell you when the rains will end, but we can't. Here's one thing we are sure of, however: The rains will end. 2:39pm: Will Harris is activated from the DL. Do not attempt to travel if you are in a safe place, and do not drive into flooded roadways. 4:24pm: Harvey is 25 miles east of Victoria. 5:35pm: Forecasters expect an additional 15-25" of rain over the next "three to four days." It's tough, it really is tough. Our thoughts and prayers are with the people in the city of Houston. This is not good. You see pictures and it's devastating. You just pray for everybody's safety. It's a pretty empty feeling to be away. Baseball is secondary right now. Our schedule, our flight times, the business, all of that is meaningless. We'll just play where they tell us, when they tell us. Anyone with a boat who can volunteer to help please call 713-881-3100. It seems probably that some homes near Clay Road and Eldridge, and in the vicinity of the Westpark Toll Road and Highway 99 will see water remain in homes for up to two months. That is not a misprint. On Sunday alone Houston recorded a one-day rainfall of 16.7" - the wettest day on record. Through Sunday the Houston officially area had received between 25-27" of rain. Governor Abbott activates 3000 National Guard and State Guard members. It's scary. It's obviously tough for us to be out here where it's 80 degrees and blue skies and there's a lot of people at home in serious jeopardy. We're human beings too. We have houses and families and belongings there too. Truly, we don't know what happens next. This is uncharted territory for Houston in terms of flooding and potential disruption to our communities. Under another tornado warning, Javier Bracamonte's wife and children pile into a closet and write their names and social security numbers on their arms with a black Sharpie. DO NOT ATTEMPT TO TRAVEL IN THE AFFECTED AREA IF YOU ARE IN A SAFE PLACE. DO NOT DRIVE INTO FLOODED ROADWAYS. From Port Aransas to Galveston Bay the storm surge is expected to reach 1-3 feet. 1:00pm: Harvey is already the single-largest rainfall-producing storm in United States history. Every single rain gauge in Harris County shows at least 24" of rain over the previous 72 hours. 2:52pm: The Astros announce that they will play the Tuesday-Thursday series against the Rangers, originally scheduled for Minute Maid Park, in Tampa. The weekend series against the Mets - also scheduled at home - might also shift to Tampa. 4:00pm: Radar shows that Harvey's center is "near or just off the Texas coast south of Matagorda." The NHC warns of 15-25" of rain in southwestern Louisiana with as much as 5-10" in southeastern Louisiana. By this time 6000 people have been rescued and a woman in Porter was killed when a tree fell on her home, the third Harvey-related death in Texas. The Rangers wanted us to play the next 3 days at their place, but they did not want to trade series with us. They wanted all six of our games at their park. The fact that the Rangers refused to go home and home with us, we had to look at all of the options that were out there. We had to look at our players' best interest and we had to look at the integrity of the schedule. They didn't want to end the season playing a 12-game road trip. I say that kind of cringing, honestly, because it pales in comparison to the true-life challenges a lot of people are facing right now with the weather down there. I say that with being very much aware of the contrast of what's really going on. Classy as always, should be absolutely ashamed. Greed never takes off days, apparently. Stay strong #HTown! We hope to be home soon. 6:31pm: Jon Daniels tells 105.3 The Fan that "switching home series wouldn't be fair to Rangers fans who had tickets to (the) September series (in Arlington)." 3:55am: South Houston, Clear Lake City, Friendswood, and Pasadena have all received more than 40" of rain. We were prepared to make the event all about hurricane relief and helping our neighbors. It had nothing to do with looking for a competitive advantage. That's an inaccurate portrayal...We didn't feel it was right to give our fans 24 hours notice that their tickets in September were now good this week. We were willing to play this series anywhere the Astros and MLB wanted, including here in Arlington. 10:51am: The Brazos River at Richmond is currently at 51.94' - almost seven feet above flood state - and is projected to rise another 6' by Thursday morning. 3:20pm: Jake Kaplan notes that the Astros only have what they took to Anaheim, so they'll wear Sunday alternate unis until the airports open in Houston. 4:00pm: After Harvey drops 50+ inches of rain on southeast Texas, the storm strengthens briefly as it slowly moves east. States as far east as coastal Mississippi and Alabama are warned for 5-10" of rain. 300,000 people are without power while several people are missing. 13,000 rescues have taken place. The meteorological event has now ended, but unfortunately this is only the end of the beginning. Now comes the hard part, putting our city back together. I'm not going to complain about our travel. I'm not going to complain about different hotels, and some of the mileage we're going to travel. I've got people swimming in Houston. Let's just be real about helping humans. I truly believe in my heart that both sides were trying to get the right thing done. I don't think there was a perfect solution. It's really weird. Never in a million years would I have thought that we would be playing outside of Minute Maid Park where we have a retractable roof for that very reason, which means that the flooding has been almost biblical. That's what you have to wrap your mind around; how crazy it is. The models did a pretty good job of predicting the slowdown and the collapse of the steering current; it's amazing to see how it was barely moved more than 100 miles or so since it made landfall Friday night. Intensity forecasts were not good early on. The early forecasts were too low. While the threat of heavy rains has ended in the Houston/Galveston area, catastrophic and life-threatening flooding will continue in and around Houston eastward into southwest Louisiana for the rest of the week. Houston is again warned to "please heed the advice of local officials," they said...Do not attempt to travel if you are in a safe place." It will be a tough game to play, but if the Astros really want to be there, it's their call. We're there supporting them. It's a really small community, this baseball world, so any bit that we can lend each other, we will. With the series compacted into two days so the Astros can spend a day with their families, the Mets decided as a team to spend Friday volunteering and many plan to donate tickets or bring families affected to the games all weekend. We feel that the Astros playing this weekend will provide a much-needed boost for our city. With all the difficulties that many of our citizens are facing, the games will provide an opportunity for families to start returning to some aspect of normal life. 9:02pm: An official crowd of 6,123 Tampa-ans (-ites?) watch the visiting Rangers beat the visiting Astros in Tampa for the second straight night, 8-1. The Astros take a 1-0 lead into 4th before the Rangers get six in the top half of the inning. The Astros manage four hits - two from Brian McCann. It's the Astros' 17th loss of August after having lost 17 of their first 59 games of the season. 10:00pm: The NHC issues its last advisory as Harvey weakens into a tropical depression over Louisiana and is expected to reach the Ohio Valley over the weekend. Early morning: The Astros submit a trade offer for Verlander, which is rejected. 11:00am: The Astros submit another trade offer to Detroit, which is rejected. That really helped make my decision. The Tigers had never really committed to a rebuild. They were going to continue to win while trying to trim payroll when they could. But once he was traded, it was like, 'OK, this is a full rebuild." To have a guy like that - not only just another veteran presence, but a guy with athleticism and a guy who has been there before - I think it will be huge. 1:40pm: Jon Morosi says the Tigers are in "active discussions on" trading Verlander. 2:27pm: Jon Heyman reports that a Verlander deal is "possible, but not probable." It's been a tough week. Obviously, we're really fortunate in so many ways, to have been able to escape the devastation that's actually happened in Houston. We've been away for a while, and we're all ready to get back home. 3:30pm: A low pressure system is expected to move into the southern Gulf of Mexico by the end of the weekend, stoking fears about another tropical system hitting the Texas coast. I think everyone just sat there quiet and stunned and overwhelmed. When we landed it was 75 degrees and breezy and sunny, and it was just strange for me emotionally. There was just such a detachment and isolation from what had actually happened here. It makes you feel guilty that you weren't here to do something. Evening: Dinner is served at Tigers GM's Al Avila's house with the Tigers feeling like they'd hold on to Verlander. 6:23pm: Bob Nightengale reports that the Tigers' asking price on Verlander has not dropped. 8:15pm: A Jerry Crasnick source says Verlander talks are "dead," and he is not expected to get traded. 8:46pm: ESPN Chicago's Jesse Rogers reports that the Cubs are the only team that could take on Verlander's contract, but a source says it's unlikely. Bob Nightengale writes that Verlander's first choice was to go to the Dodgers, but they "weren't interested," having acquired Yu Darvish at the deadline. His second choice was the Cubs, and they were willing to assume most of the contract, but "didn't have the prospects" to get a deal done. The Astros score three runs in the 8th inning and beat Arlington 5-1. The win means the Astros finish the month of August with an 11-17 record. We asked for certain players. They took certain players off the table. It was back and forth. Obviously, when a player performs well, it helps you in a trade. Obviously, [Verlander's] performance was a big help. At one point I was kind of pacing back and forth in my living room - it was just Kate and I - and I'm going, "Trust your instincts, trust your instincts. What are your instincts telling you?" If you're going anywhere, the Tigers told Verlander, it's going to be Houston. 10:25pm: Mark Berman says the Astros are "on the verge" of acquiring Verlander, but notes Verlander would still need to approve the trade. 10:47pm: Bob Nightengale, like the rest of us, is confused, reporting that the Tigers are "busily working the phones," and "it's not entirely clear what happened" between Detroit and Houston. He was a little worried about Houston (in the aftermath of Hurricane Harvey). I told him, 'This town is going to be fine. It's going to take time. You will be received great here. We've got a good team, a good manager, a good front office. There won't be any problems here." The big thing to him was that he had never been traded. He didn't know a lot about the city. I told him, "We've got a lot of good players for a few more years. This is a great spot of reaching your goal of winning the World Series. You got to take a shot." He had to make up his mind in a hurry because there wasn't much time. The baseball operations officials get a photograph of the signature and emailed it to the commissioner's office. Verlander verbally agreed to the deal on a three-way all with Manfred's office in New York. 10:59pm: MLB finalizes the trade. 11:00pm: Deadline for teams to add players who would be eligible for playoff rosters. It will soon become clear why the #Astros and #Tigers didn't complete trade, but Tigers are not blaming Justin Verlander. 11:16pm: Anthony Fenech reports that the Tigers have traded Justin Verlander, $8m in annual salary for 2018 and 2019, and a player to be named later to the Astros for Franklin Perez, Daz Cameron, and Jake Rogers. I was just so caught in between with emotion and excitement of a new ballclub, and ultimately, it came down to winning and joining an organization that's set up to win for a long time. Verlander could have held off approving a deal until the off-season and taken his chances on landing with the Cubs or possibly the Dodgers. But now he gets to pitch in a pennant race, and he gets what is certain to be a hero's welcome, rather than a city's scorn. There were several times throughout the month that I thought the trade was going to happen, and several times throughout the month where I thought the deal was completely dead. I was confident we were going to get the deal over the finish line, but I had my doubts the last 20 minutes. As news makes its way around Twitter, Astros players responded about the same way fans did. Carlos Correa broke his PS4 controller. 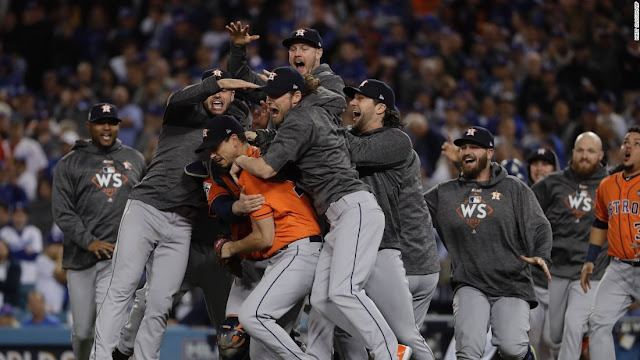 George Springer, who was watching a movie, turned to his fiancee and screamed. Altuve stopped eating so he could yell. Collin McHugh's wife woke him up to tell him (the most Collin McHugh thing to ever Collin McHugh). It's our humane obligation to make another person smile today. There are still 106,135 Houston-area residents without power, while over 41,000 homes were damaged, 6000 single-family homes were destroyed across Texas. Justin Verlander arrives in Houston. By the time the double-header is over Verlander and Kate Upton sign a lease on a house that won't expire until November. It's just incredibly sad. To see people holding trash bags of all they have left in the world. Whatever our role is, even if it's just a diversion for a few hours, it just makes me want to run through a wall for this town if it will help even a little. We beat Hurricane Harvey. We can beat Matt Harvey, too. The Astros tagged him for 8H/7ER in 2IP and the Astros won the first half of the double-header 12-8. The fact that they came out today to support us, it's crazy. There's thousands of people that don't have homes, they don't have belongings and they're rallying around us. It's our job as the sports team here to do anything we can. The goal is to provide anybody with some sense of relief. Justin Verlander is introduced at a press conference because the Astros didn't have a jersey for him yesterday. Excitement is an understatement. Anytime you get a perennial All-Star and a pitcher of (Verlander's) caliber, that just makes the team that much better. I'm just stating the obvious...It's going to be this way for a while. Hopefully this month is one of the best months we'll ever have. Carlos Correa is activated from the DL, six weeks after tearing a ligament in his thumb. The Astros went 20-22 while he was out. We're playing with passion now. Leaving is hard and it's always bittersweet, but especially now. And another long road trip seems especially cruel with everything going on, but that's baseball. We did what we wanted in coming back, we did something important: We got back home, we helped, and we got back to normal a little. So yeah, we're leaving, but we're leaving with our heads a little higher and our smiles a little wider, and I think Houston is feeling that way, too. Estimates say that 180,000 homes across Texas are damaged or destroyed. The last starts, I kind of lost my cool a little bit, and that's what led to a lot of runs. And I told myself not to do that ever again and let the guys rely on me to get it going. Everything is a lot more fun and more loose, like we were playing earlier this year. Mike Fiers is removed from the rotation to make way for Justin Verlander and the impending return of Lance McCullers. A lot of nerves, a lot of excitement. I think the closest thing I can compare it to is Opening Day kind of nerves. The unknown - I don't really want to let everybody down, new team. These guys have made the process pretty easy on me so far, just fitting in and feeling like I'm right at home as quickly as possible. There's a bombshell report in the New York Times that the Red Sox used Apple Watches to steal signs during the Yankees series. Cameron Maybin hits yet another go-ahead two-run home run, this time in the 9th, as the Astros sweep the Mariners. Lance McCullers throws 5.1IP, 4H/3ER, 4K:1BB in his first start since July 30. The Astros fall 10-2 to Oakland, completing a four-game sweep at the hands of the A's. The Astros are 86-57, 13 games up on Anaheim, whom the Astros play starting Tuesday. Cleveland beats Baltimore 3-2, the Indians' 18th win in a row in a streak that started on August 24. The Indians are 87-56 and take the AL's best record from the Astros. The death toll from Harvey rises to just over 75 across Texas. The story is almost too good to be true. We trade for him for this exact reason to come up in big moments. He was locked in from the very beginning. Nobody better to have on the mound and nobody better to celebrate with. I don't think you could ask for a better introduction for me to the city of Houston than this. First home start would have been great. First home start and a win would have been great. First home start and to win in a division-clinching game - you can't make that up. And I'm looking forward to hopefully many more wins. The Astros play the Rangers in Arlington. It's the series the Rangers did not want to flip with Houston out of fairness to their fans. Over the three game sweep the Astros outscore the Rangers 37-7. For the first time in franchise history the Astros score 11+ runs in three straight games. The final game of the series, a 12-2 win led by Justin Verlander's 6IP, 6H/2ER, 11K:0BB performance, gives the Astros their 98th win of the season - the second-highest win total in franchise history. The Rangers' loss on the 27th ensures their first losing season since 2014. The Houston Chronicle reports that the Houston Fire Department responded to over 7,800 calls for help during Harvey. The Astros lost to the Red Sox to drop to 100-61 on the season. I think every single player in the big leagues, after they win a World Series, would like to win an MVP. That would make me really proud. But to me we're still in the middle of the season and haven't done what we want to do. In the first Harvey-related hearing to the Texas State Legislature, Mayor Sylvester Turner estimates Harvey debris removal to cost $260m with damage to Houston-area public buildings at $175m. All baseball writers from USA Today and the Washington Post, and 18 of 29 ESPN pundits, pick the Indians to win the AL Pennant. So well done my friend!! What a great recap of the interaction of two events I’ll remember for the rest of my life. I was one of the many who celebrated this championship in a damaged house. So happy our team came through when we needed them most. Job well done my friend. Excellent story. This is pretty great. Thank you.